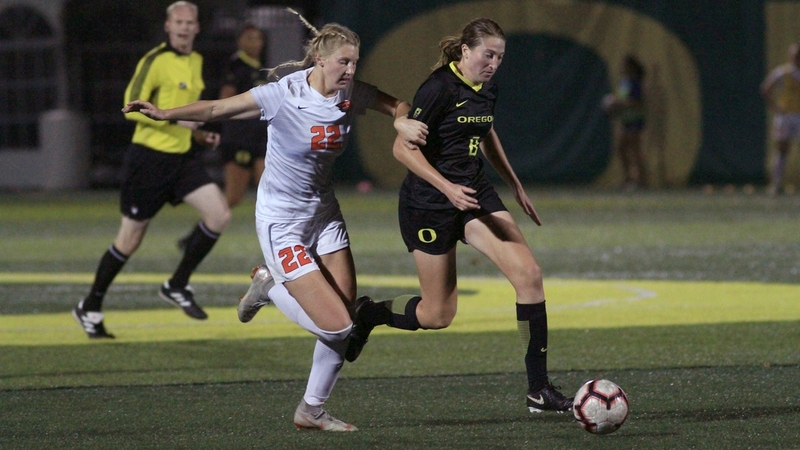 In the final match of her collegiate career Marissa Everett netted a pair of goals to lift the Oregon Ducks to a 2-0 whitewash of the Oregon State Beavers Friday evening at Pape` Field. Thirty five minutes into the opening half, Everett nailed what would be the game winner with a rocket from 35- yards out. In the 61st minute, Bayley Bruner beat the OSU defense down the left flank and fired a cross into the box. Everett pounced, taking the ball on the fly and redirecting it past the helpless Oregon State keeper for the insurance goal. Nine Oregon seniors leave the program, and with a record of 9-9-1, completed the best season for the Ducks since 2008. Their 3-8 conference mark doesn’t paint a completely fair picture of what head coach Kat Mertz and her side accomplished over the course of the season. 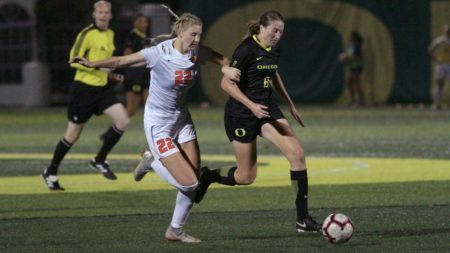 In what is arguably the nation’s toughest conference and the home of the last two national champions, six of the Ducks’ eight Pac-12 losses were by one goal and two of those came in overtime. Now it is up to the underclassmen and incoming recruits to build upon that foundation, but in setting aside those disappointing results and in closing out the campaign with a pair of victories the Ducks will carry a nice dose of optimism and momentum into the off season.